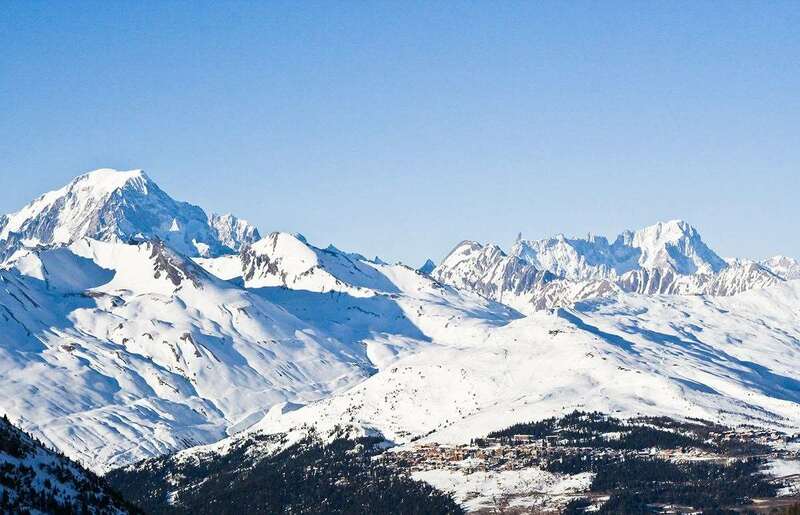 These outstanding and highly sought-after luxury apartments constructed in traditional wood and stone are located in the heart of the superb car-free resort of Arc 1950, which offers excellent access to the pistes (you can even ski through the middle, weather permitting!) and a good choice of quality restaurants, shops, bars and leisure facilities. The complex is built in Savoyard style and comprises eight residences all of which are located close to one another. The apartments are all beautifully designed in a spacious condo-style and finished to a very high standard. There is a new ‘Cinq Mondes’ spa and wellness area with indoor swimming pool, offering massages and beauty treatments (pay locally for entry), as well as the original heated outdoor pools, jacuzzi, sauna, steam room and fitness room, which are free to use. Requests for a specific residence can be made, but are not guaranteed. A half board option is also available at a supplement with meals taken in the complex at the Brasserie 1950 and Hemmingways. 2-room Apartment ‘Classic’ (A4) 36m2 – sleeps 2-4: Large lounge with double sofa bed, separate double/ twin bedroom. 2-room Apartment ‘Superior’ (B4) 46m2 – sleeps 2-4: Large lounge with double sofa bed, separate double/twin bedroom. 3-room Apartment ‘Superior’ (D6) 62m2 – sleeps 4-6 Large lounge with double sofa bed, double bedroom with en suite, bathroom with wc, twin bedroom and separate shower room with wc. 4-room Apartment ‘Classic’ (TBC) 65m2 – sleeps 4-8 Lounge with double sofa bed, double bedroom, 2 x twin bedroom, bathroom with wc & shower room with wc. 4-room Apartment ‘Superior’ (TBC) 75m2 – sleeps 4-8 Large lounge with double sofa bed, double bedroom, 2 x twin bedroom, bathroom with wc & shower room with wc. Some apartments are duplex. 5-room Apartment ‘Superior’ (TBC) 88m2 – sleeps 5-10 Large lounge with double sofa bed, double bedroom, 3 x twin bedroom, bathroom with wc & 2 x shower room with wc. Pre-bookable half board option in either La Brasserie 1950 or Hemingway Restaurant, including buffet breakfast and 3 course evening meal. Les Arcs 1950 is a beautiful but purpose built village just below arc 2000. Most of the accommodation in the village appears to be belong to Le Village Apartments as they are split across about 5 buildings, some connected with bridges. The accommodation was of a high standard and rooms clean. We heard no noise at night. It is mostly families or couples that stay in this resort. There is a huge amount of underground parking accessed via lifts from any of the accommodation buildings. Great if you decide to drive. There are a few restaurants in the village and even one small club if I remember correctly. Unfortunately the level of service received was very poor, except for in the pizza restaurant (I forget the name of it). We got the impression we received bad service just because we were English. We stayed here at the beginning of Feb, 2011. The accommodation was fantastic, we were a party of three and there was more than enough room for us all including lots of storage space (2 single wardrobes and 1 double one). The beds were comfortable and the sofa bed was easy to pull out. The apartment was clean at the start of the holiday and once during the week we were there. The bathroom was also spacious and well appointed. The kitchen was well appointed, with a 4 ring electric hob, oven, microwave, fridge with small freezer section, and a dishwasher! Plenty of cutlery and crockery was provided. The outdoor pool was heated but still quite chilly which is to be expected, fantastic views over to the other side of the valley though. There were two sauna's and one steam room as well as the indoor jacuzzi. Depending on which part fo the hotel you're in this could be quite a walk however, luckily we were 2 doors away. Never used the ski/board room as we couldn't find it and had immediate access to outside being on the ground floor. You're not allowed to walk around indoors in ski boots. Again depending on where you are in the complex you may have up to a 3-4 minute walk to the slopes proper or the small pedestrian gondola that goes up to 2000. 1950 itself is very nice, if somewhat expensive, especially to eat out. The restaraunts don't open much past 10.00pm either which is a pain if you get a late transfer as we did. The Spar has mostly everything you would need for a weeks cooking although several items are horrendously expensive (3-4 euros for a paprika spice jar and branded cereal). George's Wine bar is fantastic, he knows his stuff and you can buy bottles to take away! Overall, despite the below average snow conditions, we thoroughly enjoyed our visit and would not hesistate to stay in Le Village Apartments again!